On May 4th I gave a presentation (linked above) to a group of not particularly concerned Mensans at the Canadian Mensa Annual Gathering in Niagara Falls. The response exceeded my wildest expectations so I'm providing the Google Presentation and notes that I worked from to others who may have the opportunity to address other groups. One of the offshoots has been that I've been asked to provide a video of the talk for an educational group that works with Canada's First Nation peoples. I'd ask anyone making use of this for a presentation to provide us with a copy of the alterations made & feedback on how the presentation was received. I'd also ask that mention be made of at least one on Neven's Arctic Sea Ice sites. Those that actually did all the work of making the graphs and charts used have given their permission to use their work usually with the assumption that the useage will be in a not for profit setting and of course that credit be given during the talk. This is the presentation as delivered. It might be noted that I had no prior experience with any of the Powerpoint type of programs & that I chose the Google version simply because it's free. In the second link I've added notes in blue that I made the day following the talk & the second Presentation shows the changes as I've made them. About 6 months ago I was charged with finding speakers willing to address our annual gathering. We have a strong tradition of not paying for speakers and whether it was this policy, my own ineptitude at finding speakers or Stephen Harper's policy of silencing climate scientists, the result was that I couldn't come up with anyone willing to speak about the demise of our Arctic Sea Ice. My wife finally convinced me that I could do the job myself despite my lack of experience. I mentioned at one of Neven's sites that I was putting together a presentation and asked for help and advice. OldLeatherneck it seems has recently retired from a position in which he prepared Powerpoint Presentations for one of the Fortune 500 companies. He is responsible for much that is good in the product as given. Upon hearing of my plight he offered assistance & his help in both working up the presentation and the advice he gave me prior to the talk was invaluable. He acted as a collaborator, a mentor and a coach. If anyone should contemplate making use of this I can't recommend asking his advice too strongly. My hope is that the posters here can modify the presentation as given in two distinct ways. 1st is to improve the slides and notes to better tell the story we're all eager to tell. The original was roughly divided into 3 sections, An Introduction intended to generate a surge of interest to keep them in their seats. The Body which ends at the slide announcing that the following is speculative and the closing where I was more concerned with things pertinent to my mainly Canadian audience. If improvements are proposed it would help to have the slide numbered so it's evident which slide should be replaced & if it's a change in the notes copying the full slide and making the changes in the note section would seem easiest to follow. 2nd As mentioned above the ending of the presentation was aimed at a Canadian audience with no special interest in the subject. When other audiences in other locals are contemplated it's assumed that this section would be rewritten. Perhaps a Google Presentation that could be appended to the body section would be a good method. I'm not posting this as the final product but rather as a base from which to work. I think each presenter needs to have something in front of him that he's comfortable with. It would be nice if this turned into a truly collaborative process where people could say that they're giving a presentation from work provided by the bloggers from the Arctic Sea Ice Blog and or the Arctic Sea Ice Forum. I can't believe I'm the only only one that's had problems finding speakers. In my perfect world we'd have a number of speakers in different areas that have proven (to themselves at least) that they can give the presentation & are willing to present it again to an audience of someone elses choosing. Many Universities and newspapers have speakers bureaus that groups can contact with the expectation that the speaker will arrive on time, put on a decent presentation and stay long enough to answer lingering questions. In my perfect world a person could find Neven's site, go to a thread named Speakers Bureau and find a speaker in his area that could be relied on to wow his audience with a knowledgeable talk about Arctic Sea Ice or possibly even related topics such as Sea Level Rise or changes in the Greenland Ice Sheet. I'd written this with the possibility that my health would be bad and all I'd be capable of was reading the notes. As it turned out I was "on" that day, but I do think things would have turned out OK even if I had been flat. - Public speaking is not my forte & I hadn't addressed a group for decades. Your audience knows next to nothing about the subject - don't expect to have to answer the kind of questions that might be posed by a knowledgeable denier - be prepared but don't expect this. OldLeatherneck stressed that it's important that the audience recognizes you as the authority on the subject. OldLeatherneck recommends practicing the presentation. I felt more comfortable reading everything as I went to give it more spontaneity. I answered questions as I went which stretched the presentation's time to the limit. Next time I give it I may try waiting until the questions slide appears. Have the program on a thumb drive - don't count on an internet connection. My talk was to last 75 min. but because of lack of a thumb drive and an inability to crack the hotel's new password in a timely manner it probably went ~ 65 minutes. No one left during the talk, the room was packed with standing room only. The crowd blocked the door and the hallway. - Expect an interested crowd. Dressing like a prof that had gone emeritus worked for me. I seriously do think that dressing the part is important in doing something like this. Expect serious but simplistic questions - Someone asked how high the oceans would rise when all the floating ice melted - Wiseguy answers aren't appropriate. Talk to OldLeatherneck - a coach / mentor is invaluable. I'm more than willing to talk or E-Mail anyone who has questions. First of all I'd like to thank Terry for creating this presentation and sharing it with all of us. I think his idea of creating a template for a presentation that anyone can use, is great. Giving an Arctic sea ice talk in my local community has been on my to-do-list since last year when I wrote the Why Arctic sea ice shouldn't leave anyone cold blog post, and it would make the job a lot easier if there already was something to work with, instead of having to do it from scratch. I don't have any experience with this kind of collaboration where a presentation is created collectively. Perhaps it would be better to create a repository of different individually created presentations. Either way, it might be interesting to discuss the various aspects of such an undertaking. I've also opened a thread on the Arctic Sea Ice Forum to give the subject a more permanent status, and a place where eventual practicalities can be discussed. Having such a collective resource from which to draw is a nice idea. My main (and only minor) suggestion for improvement would be to have a consistent referencing style, and one or two graphs (e.g. N. Hemisphere temperature reconstructions near the start) don't appear to have a reference. But nice work, well done! Excellent work Terry and OLN- inspiring to see this being done. Thank you! Hi, this was really great. One question and one comment on a change of emphasis that I might employ. "Arctic sea ice acts as a buffer, cooling our summers & warming our winters" -- Slide 33. Is it true that Arctic sea ice warms our winters? I recall that the effects on the jet stream in 2012/2013 tended to cool areas over land and added moisture contributed to greater snowfall (I think), but I don't remember hearing that our Canadian winters would be colder. I thought it was just more persistent blocking that could be predicted. My comment may just be for personal preference, but I think I would instead focus on September rather than minimums. But maybe that's just me. The front row seats to the demise of Arctic sea ice just got better. May 17 was a big day for Shizuku (droplet, not water 'mizu' as you might think from the W in GCOM-W1), our favorite satellite with its 100 minute polar orbit and 6x2 channels of cloud-translucent passive microwave emissions measured onboard by the AMSR2 instrument -- Jaxa began offering ground and radiosonde calibrated brightness temperatures (TBs themselves from 25 Jan 13 on) interpreted for you as sea ice concentration, sea surface winds, snow depth and so forth. Each of these requires a journal article algorithm to get there. Those for sea ice concentration include the Nasa-Team (NT2, Markus 2000), Artist (ASI, Spreen 2008), and AMSR Bootstap (ABA, Comiso 2003). My current understanding is that NSIDC uses a different meteorological satellite F-17 and overlapping sensor sequence SSM/I, SMMR, SSM/I and SSMIS with NT/ABA, Bremen uses ASI and the 89 Ghz channel only, and Jaxa the emissivities (from temperature brightnesses) of the 6.9, 18.7 and 36.5 Ghz channels in ABA, with sea ice extent and sea ice area being further derivative products of sea ice concentration. While these are midway between misleading and useless from mid-September freeze-up to June melt season onset, this data could provide an albedo product, yielding daily and seasonal changes in the radiative heat transfer balance -- the reason what happens in the Arctic doesn't stay in the Arctic. Here the solar surface radiation is coming from a 6000 K blackbody whereas the emissivity is that of a 273 K graybody, so according to Stefan-Bolzmann (T to the 4th), we're toast once the summer ice melts but still freezes over in fall. Although a lot of imagery has long been offered directly at their overlay facility (even better resolution from drilling into their file system), anyone can register for custom data. The reason for registration being they need your email to send the url to the data after your request has been processed. It's all explained in great detail in their documentation. Below I've attached an animation takikng 36v, 36H, 18V channels as RGB from 01 April 13 to today 21 May 13. It is at native resolution, which means for the relevant part of the Arctic Basin, some 90,000 pixels or 60% of the pre-masked image. A-Team's animation shows quite a bit of a "whiplash" in the Beaufort. Should get interesting real quick. Thanks for the kind words - and especially thanks to all that helped with the graphics that made up the bulk of the presentation. I'm inviting criticism so that this can evolve into something that the Arctic Sea Ice community can take pride in, even if no presentation is ever made in your area. I'll try to respond to all suggestions made & those I feel comfortable with will be incorporated into the NiagaraModified presentation which is the version I'll be using next time the opportunity arises. I think you may be right. WhatI'd been considering was the latent heat uptake and release during the freeze/melt cycles. During todays melting months, say from April to September, enormous amounts of sensible heat are being used to melt ice while in winter the freezing of Arctic ice stabilizes ocean temperatures at about -2C. In months without ice starting in September, then progressing through August and July the latent energy now melting ice will be released as sensible heat so cooler spring and summer temperatures with ice should be accurate. In the months when freezing now occurs from October through to March freezing will still be occurring at about the same rate as today so no change in fall or winter would be more accurate. The present melting months of April through September will be exhibiting an increase in sensible heat so the Arctic ice is providing cooling in spring and summer. In the months when freezing now occurs from October through to March the lack of ice would mean no change of phase. Without the phase change temperatures would be colder, but since this will only occur in warmer conditions the phrase "Arctic ice keeps winters warmer", while accurate probably conveys the wrong message. Trying to synopsize this into one sentence may be beyond my limited literary prowess. "Arctic sea ice acts as a buffer, cooling our summers & warming our winters." "Arctic sea ice acts to stabilize Arctic Ocean temperatures to ~-2C which affects Northern Hemisphere weather year round." I've changed slide #64in the NiagaraModified presentation using the new sentence. Working with Terry to help polish his presentation was a rewarding experience. After a lengthy telephone conversation, it was evident that Terry was a gifted storyteller. The task at hand was then a matter of putting his story into a quasi-professional looking series of charts. To set the record straight, Terry may have been overly effusive in his kind words about my contribution. While it's true that I've been making and giving presentations since the last millennia, during the latter years of my career, I had access to editors, graphic artists and 24/7 IT support when working on various proposal efforts. Collaborating via GoogleDocs was a new experience for both of us, yet we managed to navigate the process. Personally, I prefer making the charts using Power Point and then using the Google platform for sharing. I can envision a series of presentations, covering all thing cryospheric that can be tailored or augmented for specific audiences. As time permits, I will post more of my tips on effective presentations on the Forum thread that Neven opened yesterday. I'm looking forward to collaborating and supporting any efforts to further communicate the threats we are facing. Again, Kudos to Neven for providing ASIB and the Forum as a place that we can learn and share knowledge. Neven, you might want to use the Open Source collaborative computing development model for this. Someone owns the core. Contributors contribute to the core and the core updates with versions. People who wish to build on the core make Forks from the core. Taking the core material and building on top of it in different directions. Any improvements they wish to make to the core, they feed back and it forms part of the basis of the next core. When the core is upgraded to a new version, all forks then re-baseline on the new core. Does that make sense and work for you? Someone will need to own the core and manage the versions. Congratulations to Terry & OL--haven't looked through the presentation yet, but this is obviously a very good idea. The first question at a "demise" talk might be 'what are you predicting for summer 2013'. Wipneus has probably given the best overall answer to that -- the geospatial cell-by-cell exponential downtrend in volume in coming years -- but a temporary September minimum area uptick will still perplex a non-specialist audience. So what is going to happen -- can we find a set of proxies today that predicts a record -- or at least respectable -- melt season? Craig M sees the 'Beaufort getting interesting real quick'. I also think that likely based on open water and melt on both sides of the Bering Strait. I've been keeping an eye on three other developments -- the recent gyrations in the Kara Sea, anomalous temperature brightnesses in upper Nares Strait, and the collapsing arc between Banks Island and Cape Bathurst -- based on newly calibrated 89V Ghz Jaxa imagery which we have not utilized previously on this site. The temperature brightness scale here is Kelvin. It is related to but not quite the same as near-surface ice thermometer temperatures which we can track better from thermistors in the buoys or the AVHRR (often useless these days because increasing cloud temperatures (to -0.6 ºC today) have become opaque to the satellite's infrared sensors). The Kara Sea area lies northeast of the tip of that elongated Siberian island Novaya Zemlya whose Holocene sea level / isostatic rebound after Weichselian glaciatian is reconstructed here). After enhancement and tiling of the Modis 1 km swath r03c05 on 20 May 2013 (day 140), you can see the region consists of open water, floes, and thin gray ice binding them together. The far lower resolution Jaxa microwave animation shows a broader region over the last month; it is rotated 90º relative to Modis still, with the last day 21 May 13 paused. You can see some outright ice disappearance on the northenmost Barents Sea side and possibly portentious churning in the upper Kara. However this region has had an on-and-off history since March, it is a difficult proxy to develop for overall melt season trend or inter-year comparisons but early open water there would have consequences. The Northern Sea Route -- Vilkitsky Strait and all that -- and its inconsequential future signifcance for shipping as recounted at wikipedia -- makes interesting reading vis-a-vis glowing press accounts. The ice arc bridging the Amundsen Gulf between Cape Bathurst and Banks Island collapsed dramatically last year on 27 May 12, if you recall that animation from "On the Move". Initial collapse this year occurred on 19 May 13 as the ice pack shifted and may progress further in the next few days. Ice deeper within the Gulf is typically 2 m thick. Despite being a week earlier than record year 2012, the region is again a problematic guide to progress of the overall Arctic melt season. Can I be really superficial and talk mainly about style? The content seems great - but do you really want the conclusion to be so down? Is there nothing we can or should be doing to slow it down/prepare for the on coming disaster? Ok so on to style - generally this is far better then a lot of presentations I've seen, so if the following seems to be nit picky- it's because you've already got a lot of the basics covered. My main complaint is that when making a powerpoint you should never, ever, ever, use comic sans as a font! Helvetica is much better. I tend to use either that or TW Cen MT. Some slides are still too busy and have too much text (especially slides 35-39). Slides are free you don't have to cram each one - just use lots of slides. It's also vital that where possible you avoid reading from slides. This very quickly makes an audience tune out. Titles on slides with graphs should say what you want the audience to take away. So for example instead of " PIOMAS volume data w/projections", you could have "Volume is projected to reach zero in September 2015". If you are really want to show off then maybe someone could use PREZI - presentations using this medium can be amazing, but used inexpertly they're likely to make the audience feel queasy! I'd suggest that you replace that graph with this one, which shows the same thing, but takes us all the way back to the cambrian, you need to take a good deal of time to explain how the plot is stretching time along the x axis. The truth that “sea ice warms our winters”, depends on where one lives. Sea ice does tend to stabilize the NH jet stream circulation that carries heat from the N Atlantic to Britain/Europe, and from the Pacific to the west coast of North America. In the past, this circulation has stabilized the continental weather. Sea ice was a year-round sink for latent heat. It also provided huge thermal inertial. As a year-round sink, sea ice cooled the NH, even as it helped drive the atmospheric circulation that moderated the weather on the continents. While sea ice helped drive circulation patterns that kept the continents warm in winter, sea ice per se, never warmed our winters. Loss of year round Arctic sea ice will result in a more north/south oriented atmospheric circulation which will drive North Atlantic Drift water into the Arctic proper. The combination of these changes in atmospheric and ocean circulation with the changes in the Arctic albedo will result in a much warmer Arctic. The Arctic will become a year-round source of latent heat. This will disrupt the jet stream. This is a sea change. Loss of a stable jet stream means that heat transfer to the interior and heat transport out of the interior of Eurasia and North America will be erratic. This is the so called “cold continent” effect. The best I can estimate is hot summers with winters punctuated by occasional, ferocious snow storms. Slide 31 is the most important slide because reminds us that global warming and sea ice loss was going on before satellite. That means that the feedbacks in slide 34 have been operating for some time. Canada has infrastructure build on permafrost. Collapse of permafrost results in nutrients in near shore waters that alter fisheries' productivity. Mix of forest species changes resulting in changes in timber industry and wild life. The one class of wild life that is certain to flourish over the next 2 decades in Canada is mosquitoes. Terry and Neven great idea on the collaborative. There are lots of platforms to do this. The key is to tell a good story and that means bringing the sea ice to some life. And the life on and under the sea ice into the story. And the glaciers meeting the sea ice in to the picture. If we each generate a few slides of what we do best animation etc. Those parts are the key to a good whole. "In the months when freezing now occurs from October through to March the lack of ice would mean no change of phase. Without the phase change temperatures would be colder, but since this will only occur in warmer conditions the phrase "Arctic ice keeps winters warmer", while accurate probably conveys the wrong message." As long as there is a combination of ice and water the temperature nearby, air and water, remains at the freezing point. If there is no ice it will remain above the freezing temperature, that is, warmer, than it would be if there were ice. Nice work A-team, !! My latest observations again demonstrate a strong relation between melting of sea ice with sun higher than 25 degrees elevation in clear skies, or with sun at almost any elevation above 10 degrees when cloudy. So it is essential to find if its sunnier during afternoon or night. Cloudier at night all the time means an accelerated melt. So on your great satellite sequences, can you do the opposite than usual and enhance cloud detection in a way that we can recognize a pattern? With our ability to recognize a cloud diurnal effect we can easily estimate the rate of melting, slow if clear at night (low sun) fast if the clouds avoid radiation escaping to space. I have been a lurker for a while now, and have been astounded at the level of discourse here. I have learnt a great deal about the situation in the Arctic. I wish it was less depressing! I don't have the scientific credentials that many of you have, but I do have a fairly unique history of both working for Government (in the Office of Climate Change in Western Australia), so understand the science and the policy issues to a large extent. But I also have worked for the BBC in London and am a writer, so I have a distinct communications slant to my CV too. I also have a degree in Sustainable Development. So, with that intro out of the way, I'd like to say to Terry that the presentation is a great foundation to work from. All involved have done a great job. My advice and comments are that there is no positive (or as positive as is possible) conclusion. I have been mulling the idea of talking to grass roots organisations in my part of the world on Arctic Sea Ice melt, and what it means. But I have been here before and I have read and understand some of the work about communicating climate change. Just saying that it's all big and scary doesn’t work and the science is complex. There needs to be some part that says what solutions there are and measures people can take. People need to be empowered and given hope (Lester Brown’s books are successful in large part due to this). Otherwise there is only shock and disengagement, as it really is too large for us to comprehend. For instance, there are very learned people on this site, and they all know the potential consequences of an ice-free arctic. But the discourse here isn't about what we will do once it happens (hoping that it won't but reality is that it's unlikely to be averted). But even here living in a world without Arctic sea ice is too scary to connect with properly. I have already started (but only just!) a powerpoint presentation and I’ll continue with it. I’d be more than happy to email it to Neven and have it available for all to use, edit etc. Once it’s done I’ll start organizing some small meetings with people in my social networks to do a couple of test runs and hone it further, and see what happens from there. 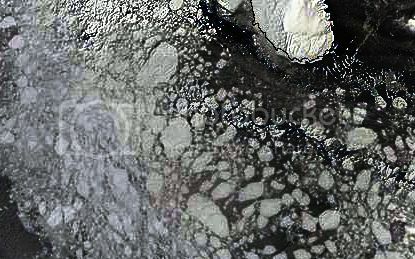 When I typed "Arctic Sea Ice" this blog came up first. It is the first time you have beaten NSIDC - congratulations! Dan, let us know how it goes. Like I said, we would need some kind of repository, perhaps chopped up in segments like Mauri suggests, so that people can pick, choose and compose their own presentation. I think this is a really exciting idea, but personally have a couple of problems: 1) No time because of work, blog, house to build, family, life in general, 2) no knowledge or experience whatsoever with either powerpoint stuff or collaborative projects. If anyone wants to take a lead in this, great (if not is fine too), or else I might do so next year. If I would make my own presentation I'd model it after the Why Arctic sea ice shouldn't leave anyone cold blog post I link to above, chopped up in segments: Background and history of Arctic sea ice - recent developments - consequences in the Arctic - consequences outside the Arctic - BAU not an option. "If anyone wants to take a lead in this, great (if not is fine too), or else I might do so next year." Terry and I are willing to take the lead on this. We have established a good working relationship and are looking forward to collaborating with others who have more knowledge of the sciences and more skills in graphic arts. Because this post of Neven's will soon be superseded by new posts as the melt season gets more active, many of these valuable comments may get lost in the dust. Therefore, Terry and I have decided to migrate each individual comment, relevant to the presentation, over to the Forum on the thread Neven opened in Developers Corner. I will begin this migration over the course of the next few days. This will be and exciting journey for all who decide to participate in the collaboration at any level. Terry and I can be contacted via Private Message on the Forum, or if you wish to send attachments, my private e-mail is available, under my profile on the Forum. Again, sincerest thanks to all who have provided valuable feedback. Just had a post swallowed by the Spam filter!! "A Russian drifting Arctic research station is to be evacuated because the ice field around it is melting, the environment ministry in Moscow reports. The Russian ministry said the "abnormal development of natural processes" had endangered the lives of staff and the work of the station." Wayne, you have pinpointed the essence of uncertainty in understanding Arctic sea ice loss and its downstream consequences: "it is essential to find if it's sunnier during afternoon or night. Cloudier at night all the time means an accelerated melt. Can you enhance cloud detection ... recognize a pattern?" Yes, it's fairly easy to delete the ice and just count cloud cover pixels on a small scale, despite journal whining about poor contrast between white ice and white clouds in Modis (unsuitable to being with being daytime only, summer-plus-shoulders only): clouds (other than ice fog over leads) move orders of magnitude faster than overall pack ice and their surfaces are often at very different infrared temperatures. So that part is technically a nothing-burger. However developing multi-year, whole-Arctic, day-vs-night statistical trends involves processing a whole lot of images made of time-stamped swaths -- Ceres alone sends down 6 million images a day to a receiving station in Norway. Given a couple of weeks, I could maybe wrap my head around their product-ordering interface. Big time-saver: I tend not to read very far into journal articles that cut down to binary clouds (each pixel classified yes or no as cloud) or rely on estimates in ship logs (can you believe that in 2011?). Clouds can be thick or thin, water vapor or ice, with droplets and crystals of different sizes, at a large range of temperatures and vertical profiles, with these properties -- and their interaction with the electromagnetic radiation -- varying over multiple intrinsic time scales (eg diurnal). Less future ice suggests more water vapor and more clouds (though how much cloudier can the summer Arctic Ocean get?). The cloud and aerosol scientific situation is still murky in a lot of ways, despite having the Ceres down- and upwelling radiometer, CALIPSO lidar, Modis visible and near-IR and CloudSat radar on the job. Ceres skips the theory and just measures top-of-atmosphere solar inputs and the earth's reflective (shortwave) and emissive outputs (longwave). Here's a Ceres sampler: June, July and August 2009. Somewhere out there in internet land -- I couldn't say just where-- there sits many months of both this and longwave (infrared emissions) in polar projection. Let me endorse OLN's comments above. This is a new concept for (all?) of us & there are going to be bumps along the path. I just recieved a message from the folks that want the presentation for a First Nations education project so I'll have to get started in that direction. I'm typing between doctors appointments so don't have time to address each of the posts just yet. There is a problem about the latest modified versions not being visible from the posted URL - if anyone is familiar with Google Drive and how to share things properly - please advise. Terry writes, "wants the presentation for First Nations". Uh oh, in that case, you might want to tone down "the Anasazi thought they were resilient" before someone flings an atlatl. First, Anaasází is a Navajo word for ancient enemy (ie Hopi), a bit upsidedown given the Navajo and Apaches were the regional pre-columbian aggressors recently immigrated down south from Athabasca. The name used down here today is Ancient Puebloans. And they were in fact quite resilient -- just moved onto the southern mesas and larger river bottoms during the century-long Four Corners drought of the 1100's that brought an end to their irrigated agriculture. Their living descendants -- based on mitochondrial DNA and language affinities -- are called Hopi, Zuñi, Keres, and Jemez. For decades, archaelogists went on and on about the mysterious disappearance of the Ancient Puebloans. The whole time the Hopi were up on the hill, waving their hands, and calling out "youhoo, we're over here." Nobody knows what ancient Puebloans thought about anything. The closest you could get would be Hopi oral traditions and the continuity in clan petroglyphs, as you might see comparing Sand Island to Second Mesa. As an interesting aside, I was fascinated by A-Team's comments about the Anasazi. When Terry and I had our first telephone conversation, he asked me about my interest in archaeology. Not a week later, my wife the retired academic who refuses to be retired informed my of a "brown-bag" luncheon seminar at the non-profit gallery that she is the financial manager. This particular seminar was about the history of Pueblo Pottery presented by a local artist/attorney/rancher/collector. Since my favorite art forms are Native American sculptures and pottery and having visited many of the cliff dwelling sites in Arizona and New Mexico I felt obligated to attend. It was a fascinating bit of history, then later finding at home a wedding gift that was an original piece of Pueblo pottery. Next time I meet this artist at a gallery opening, will make sure that she gets the interesting vignette that A-Team provided about the Pueblo dwellers. If you spend enough time on this site, you may qualify for a graduate degree in any number of disciplines. Why is typepad's Spam Locker the internet's equivalent of Solitary Confinement?? I would think you would have a good idea of a diurnal cloud effect. Don't know if you can do that, but read a temperature not attainable by sea or ice at this time of the year, say an ir color representing -10 C, calculate local apparent noon and midnight results ( another challenge is sectioning the polar region when its noon on one side and midnight on the other ). I think you can get a number which will reveal low cloud extent. Low clouds are strong ice melters, the sea thermal signature alone is very potent, sea thermal radiation escaping to space makes ice in darkness and in the warmer season saves it. thank-you to everyone involved in putting this post out there - this is very important material to share in many respects. Wayne, let me reflect for a couple days about the best way forward on this adsorbing topic of cloud interacting with Arctic electromagnetic radiation. Meanwhile I wonder what we will be using to kept track of the Arctic sea ice if the summer proves warm and cloudy. It won't be Modis visible or AVHRR infrared as they can't see through the clouds very often even now. That leaves microwave satellites but these have issues in summer beyond their so-so resolution, namely interference from water (dielectric constant ~80) and salty water on the ice, roughness of the open water, and translucency of wet clouds, and -- worst of all -- slow acquisition of swaths comprising the image relative to rapid change of conditions underneath. Jaxa RGB is our best known source of summer imagery, yet it began offering product only on 24 July 12 so multi-year comparisons are out (leaving Ascat and QuikSat grayscales, plus a half dozen buoys). That imagery is 'challenging' but not hopeless to work with. The animation below looks at the weeks flanking the 16 Sep 12 sea ice extent minimum of 3.41 million sq km reported by NSIDC. Despite the vicissitudes of the swaths, it proved fairly easy to consistently remove open water (pink below) as it occupied disjoint volumes in color space from the ice. Normally this would be done by a support vector machine or k-means semi-supervised clustering into Voronoi cells but I took the low (heuristic) road. The complement of the pixel count of open water and land mask is, after normalization to NSIDC's 3.14 m sq km, the area of remaining ice. While this lined up fairly well with what NSIDC got with a different satellite and different algorithm -- establishing the utility of Jaxa during peak melt season -- here remain serious questions about what is actually down there then. I would say binary classification -- ice or not ice -- does not cover the options. The 49 terms for snow and ice in West Greenlandic " might be a better place to start. Just to add some historical perspective to OL's observation on Anasazi vs Puebloans, the topic traces back to 1911 and Franz Boas calling Inuit 'Eskimos', perhaps not realizing this was a derogatory term of a tribe to the south for eaters of raw meat. We have the same thing going on today around here with different bands of Paiute and Shoshone calling each other marmot-eaters and worse. If you translate tribal names for themselves, it almost always works out to "the People", others apparently being lower life forms. Political correctness -- it's a full-time job to keep up! I believe similar numbers of different names regarding ice and snow is found in the Sami, Norwegian, Swedish, Finnish and Russian language, probably not Canadian and American they are too young and influenced by too many cultures even way up north. But the Norwegian word ROTEN (rotten) is probably the best word for the general situation in the polar sea, and it is now well adapted into the English language. Like Rucksack, Slalom, Fjord and many other words, not to forget the Swedish word, Smorgasbord. if one counts in the compounds, there are hundreds of those in finnish but a quick search through the list (http://erimaassa.blogspot.fi/2011/03/finnish-words-for-solid-h2o.html) produces 28 different words used solely of solid forms of H2O and not on anything else. There are a couple more I didn't list in there so 35 specific words might be a good round number. Anyway, we do not have the verb 'to snow' I guess because the intensities of snowfalls have been deemed more relevant than simply the fact that it snows. to add, we have verbs for 'heavy sleeting', 'fast cold snowing' and 'visibility reducing snowing' , I love this language sometimes. "...a support vector machine or k-means semi-supervised clustering into Voronoi cells..."
one of the most peculiar ones would be 'ice under water, attached to the bottom' that has found modern use in hydroelectric plants where it sometimes reduces the outflow and thus output, not a very serious problem but anyway a thing that must be counted in. Can't translate it now to finnish since I've forgotten the word :-D. But still, there are glacier/mountain words and some permafrost words that finnish has taken as loanwords. 'lavine', 'yedoma' and the 'snow accumulation that hangs on the leeward side of ridges' (now what was that word) come to mind. Espen, my knowledge of Swedish is unfortunately limited to 'svenska bikini laget', which references an imaginary national swimsuit team who famously rapelled into an Old Milwaukee beer commercial in 1991. As far as 'roten' goes, could not "Something is rotten in the State of Denmark" (Scene IV, Hamlet) describe Baltic sea ice during the Medieval Warm Period (favoring first scientist Francis Bacon as Hamlet author), rather than presage Bjørn Lomborg? Near-surface satellite imagery is not measuring what we need to be measuring: the increasing rotteness of the ice. Wayne mentioned upward-looking sonagrams. These would indeed give informatively mushy reflections. However my understanding is that while the drifting buoys do ping the bottom of the ice, only a simple return time is recorded. Moored buoys take an "Eulerian look at draft and bottom topography of pack ice drifting overhead from a safe 45 m down". An Eulerian path is a graph circuit visiting each vertex once; I have no idea what an Eulerian look is. Buoys are just points, IceBridge is just lines (have they released real flightline data? ), but the Arctic Ocean is a large surface. We don't have the amazing 150-MHz coherent radar depth sounder tracks for Arctic ice thickness like Gogineni's group provided for Greenland (search blog for 'Kansas' to see this imagery). Articio observes in a forum that with 7,000 mass balance buoys (instead of the current 7), we might have a clue on ice physics today. Indeed. Taking the Arctic Basin proper as 7,000,000 sq km (from lat-long geoid areas provided by the National Geospatial-Intelligence Agency), that pencils out to 1 buoy per 33 x 33 km. I'm not sure where the sweet spot lies, 700 buoys gives 100 x 100 km cell coverage, not good enough. The Army's buoy home page says 2012G was colocated with Russian ice camp SP-40 and provides a long-dead link to their data; I could work up to the parent page but it is in Russian. My idea here was the camp's additional measurements would strongly supplement buoy measurements. Meanwhile the lat long of that buoy conflicts with that provided for abandonment of SP-40, as does that of 2012H, the only other one in the vicinity. Did the ice camp and buoy part company -- or were they never colocated to begin with? We could do a whole lot more here with the internal temperature profile provided by the string of internal thermistors on the buoys. That is, given the temperatures above and below, departures from heat equation solution reflect changing properties of the ice, for example internal capture of sunlight or time dependence of thermal conductivity. "I would think you would have a good idea of a diurnal cloud effect." Uh, no. The CERES instruments are all on-board Sun-synchronous satellites. That means the instrument goes overhead any particular latitude at the same local time each day. Various longitudes are covered by successive satellite passes. So, no day/night comparisons for clouds from this data. "The IMB is an autonomous, ice-based system, designed to measure and attribute thermodynamic changes in the mass balance of the sea ice cover. The instrumentation of the autonomous mass balance buoys typically consists of a Campbell scientific datalogger, an Argos transmitter, a thermistor string, and above ice and below ice acoustic sounders measuring the positions of the surface and bottom within 5 mm. In addition to the mass balance instrumentation the buoys also have a GPS, a barometer, and an air temperature sensor." It sounded to me as if the problem of the camp wasn't the ice thickness per se. It sounded more like the ice is fragmenting badly despite the ice remaining at or near max thickness for the year.